At only 0.375" thick, the ABS Low Profile Tray from Fox Bay Industries allows the user to find the most beneficial position for the keyboard without having to accommodate uncomfortable obstructions beneath the tray. When placed on the ABS Plastic Low Profile Tray, especially one installed on a keyboard arm with a similarly slim mounting bracket (such as the Ovation Low Profile Leverless Arm) a keyboard can be comfortably positioned at thigh level, and/or at a negative incline (tilted down) without restricting movement of the knees or thighs. Note: To be sure this tray will fit an existing keyboard arm, please compare the mounting hole pattern on the installed arm with the Mounting Hole Pattern on the diagram. The simple, clean design of the ABS Low Profile Tray is also free of obstructions on its upper surface, (such as raised edges or built-in wrist rests) that could increase the risk of injury to the sensitive pressure points on the underside of the wrists. The rear edge is raised to keep the keyboard in place when the tray is at a negative incline, and is notched in two places to route cables. Composed of rigid ABS Plastic, and eleven inches deep (from front to back), the ABS Low Profile tray can accommodate specialty ergonomic keyboards (including adjustable or separated keyboards). The tray is available in widths of 30", 27", 24", 22", 20" and 18", with the 30" tray large enough for practically all keyboards and pointing devices. The FB-T30x11-RH is specifically designed for users who mouse righthanded and want to keep their keyboard closer to centrally positioned in front of their monitor. Most desk layouts are designed symetrically which means that the tray is centrally positioned, moving the keyboard to the left of centre, forcing the user to postion themselves off-centre. The FB-T30x11-RH tray moves the tray 2.5" to the right, thereby moving the keyboard back closer to a central position. This actually works very well for users employing a keyboard with the numeric pad on the left side. The combination of the repositioning of both the keypad and the tray create a central positioning for the alphanumeric keys. À seulement 0.375 po d`épais, le ABS Low Profile Tray de Fox Bay Industries permet l`utilisateur de trouver une position la plus avantageux pour le clavier sans d`adapter aux obstructions inconfortables dessous la tablette. Lorsque le clavier est mise sur le ABS Low Profile Tray, surtout si installer sur un bras de clavier avec un support de montage mince semblable (comme sur l`Ovation Low Profile Leverless Arm), un clavier peut être mise dans une position confortable au niveau des cuisses, ou/et sur une pente négative (pencher vers le bas) sans réduire le mouvement des genoux ou cuisses. Veuillez noter: Pour garantire cette tablette soit compatible avec un bras de clavier présent, s`il vous plaît comparez le schéma de trou de montage sur le bras déjà installer avec le schéma de trou de montage sur le diagramme. Le concept simple et propre du ABS Low Profile Tray est aussi libre de toute obstruction sur la surface supérieure, (tel que les bords surélevés ou des reposes-poignets intégrés) qui peuvent augementer le risque de blessures sur les points de pression sensibles sur le dessous des poignets. Le bord derrière est surélevé pour garder le clavier en place quand la tablette est sur une pente négative, et est dentelé en deux places pour faire passer les câbles. Composé en plastique ABS, et onze pouces de profondeur (devant-à-derrière), le ABS Low Profile tray peut répondre au bessoins des claviers ergonomiques spécialités (qui inclus des claviers ajustables ou des claviers séparés). La tablette est disponible en largeurs de 30 po, 27 po, 24 po, 22 po, 20 po, et 18 po, avec la tablette de 30 po qui est assez grand pour pratiquement n`importe clavier et n`importe dispositif de pointages. The Low Profile Tray from Fox Bay Industries is now available in a Phenolic Resin version in addition to the well-known ABS Plastic model. The phenolic material provides a more rigid surface than ABS Plastic and at 0.25" is even thinner than the ABS Plastic Low Profile Tray. When placed on this tray, especially one installed on a keyboard arm with a similarly low profile mounting bracket, a keyboard can be comfortably positioned at thigh level, and/or at a negative incline (tilted down) without restricting movement of the knees or thighs. Note:The Phenolic Low Profile Tray is pre-drilled to fit any model of the Ovation Low Profile Leverless Arm. However, it may also be possible to fit this to existing arms. To determine whether this tray will fit other keyboard arms, please compare the mounting hole pattern on the installed arm with the Mounting Hole Pattern on the diagram. The simple, clean design of the Phenolic Low Profile Tray is also free of obstructions on its upper surface, (such as raised edges or built-in wrist rests) that could increase the risk of injury to the sensitive pressure points on the underside of the wrists. The rear edge has a 1" raised Keyboard Guard to keep the keyboard in place when the tray is at a negative incline, and which features innovative cable routing guides on both the left and right. 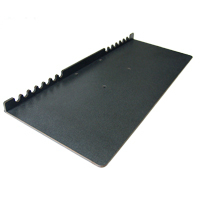 The Phenolic Low Profile Tray is available in 24" and 27" widths. At 11" deep, both models can comfortably accommodate the space requirements of most mice. Note:Trays such as the Phenolic Extra-Deep Low Profile Tray and the Extra-Deep ABS Plastic Low Profile Tray, also by Fox Bay Industries, are better suited for central pointing devices. At thirteen inches deep, the Extra-Deep ABS Low Profile Tray from Fox Bay Industries is 4" deeper (from front to back) than most standard keyboard trays and was designed to accommodate central pointing devices. The extra depth provides plenty of space for these alternative input devices to be fully supported when properly positioned in front of a standard or specialty ergonomic keyboard. 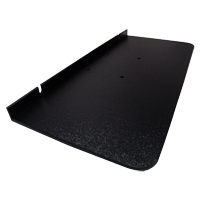 The Extra-Deep ABS Low Profile Tray is available in widths of 30", 27", and 24". 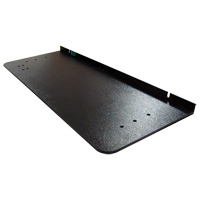 All trays are equipped with a 1" raised Keyboard Guard which features cable routing notches on the left and right. The 30" wide tray has plenty of room for an additional mouse, track pad, numeric keypad or even a notepad to be placed on either side of the keyboard and central pointing device. The 27" and 24" inch models offer less extra space but serve well where the workstation has limitations on the width of tray that can be accommodated. Note: "In order for the tray to be fully stored underneath the desk it must be mounted on a keyboard arm with a 28" track. (A suitable option would be the Extended Track Ovation Low Profile Leverless Arm - Model: 8624D28). If there is insufficient depth beneath the desk top to accommodate a 28" track the Extra-Deep ABS Low Profile Tray can also be mounted to a standard length (23") arm, such as the 8624D23. Be aware, however, that shorter track models will not permit the tray to recess fully beneath the desk, even when fully retracted. The Extra-Deep Low Profile Tray from Fox Bay Industries is also available in a Phenolic Resin version in addition to the well-known ABS Plastic model. At just 0.25" thick the Phenolic Extra-Deep Low Profile Tray presents an even lower profile than the ABS version yet provides a surface with even greater rigidity. When placed on this tray, especially one installed on a keyboard arm with a similarly low profile mounting bracket, a keyboard and pointing device can be comfortably positioned at thigh level, and/or at a negative incline (tilted down) without restricting movement of the knees or thighs. At 13 inches deep, this extra-deep model offers an additional 4 inches of depth when compared to most standard keyboard trays. This extra depth provides plenty of space for central pointing devices to be fully supported when properly positioned in front of a standard or specialty ergonomic keyboard. 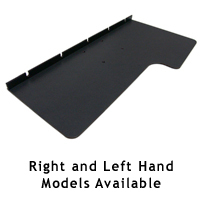 Available in 24" and 27" widths, this tray is also wide enough to permit users to gain full benefit from their Adjustable or Separated Keyboards even while using a central pointing device. The simple, clean design of the Phenolic Extra-Deep Low Profile Tray is also free of obstructions on its upper surface, (such as raised edges or built-in wrist rests) that could increase the risk of injury to the sensitive pressure points on the underside of the wrists. The rear edge has a 1" raised Keyboard Guard to keep the keyboard in place when the tray is at a negative incline, and includes innovative cable routing guides on both the left and right. Note: This tray must be mounted on a keyboard arm with a 28" track in order to recess completely beneath the desk when it is stored. (A suitable option would be the Extended Track Ovation Low Profile Leverless Arm - Model: 8624D28). If there is insufficient depth beneath the desk top to accommodate a 28" track the Phenolic Extra-Deep Low Profile Tray can also be mounted to a standard length (23") arm, such as the 8624D23. Be aware, however, that shorter track models will not permit the tray to recess fully beneath the desk, even when fully retracted. Compatibility Note: To ensure that this tray will fit an existing keyboard arm, please compare the mounting hole pattern on the installed arm with the Mounting Hole Pattern on the diagram. Measuring only 9" deep, the ABS Plastic Low Profile Shallow Tray from Fox Bay Industries is designed for applications where there is limited storage space. 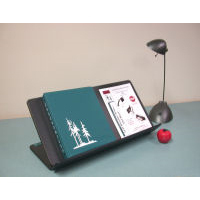 At only 0.375" thick, this tray from Fox Bay Industries allows the user to find the best position for the keyboard without having to accommodate uncomfortable obstructions beneath the tray. A keyboard can be comfortably positioned at thigh level, and/or at a negative incline (tilted down) without restricting movement of the knees or thighs. The compact 9" depth of this tray requires a full 2" less of storage space than more traditional 11" deep trays, making it an ideal companion for the Tenor Trackless Keyboard Arm or the 17" track version of the Ovation Low Profile Leverless Arm. Due to the intent of this tray being used where space is limited it is only available in a 24" width - sufficient to support most keyboards and a mousing device. The simple, clean design of the ABS Low Profile Shallow Tray is also free of obstructions on its upper surface, (such as raised edges or built-in wrist rests), that could increase the risk of injury to the sensitive pressure points on the underside of the wrists. The rear edge is raised to keep the keyboard in place when the tray is at a negative incline, and is notched in two places to route cables. Note: If more working space is required users may wish to consider other keyboard trays such as the 11" deep ABS Plastic Low Profile Tray which is available in 27" and 30" widths. This tray will not fully store and will extend at least 2" when used on keyboard arms that do not have sufficiently deep storage tracks. 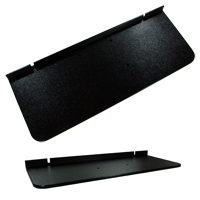 The Low Profile Tray for Mouse Intensive Users is specifically designed to provide an oversized mousing area for users whose work includes a high degree of mousing, or for those who use a larger mouse or one which is often used with full arm movements (such as the HandShoe Mouse). The dedicated mousing area is 12" wide and 15" deep, enough to even provide a degree of forearm support for some users. With 18" of dedicated keyboard space the tray can also comfortably accommodate the widest of keyboards with little or no intrusion into the mousing zone. 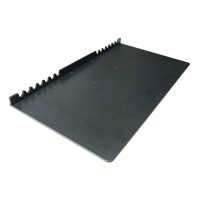 A 1" high keyboard guard with five cable cutouts for convenient device cable routing is mounted at the back of the tray. 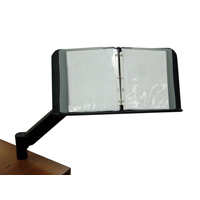 This tray is available in models to serve the needs of both right and left handed users. The tray is constructed using phenolic resin ensuring a rigid surface, even at just 0.25" thick. 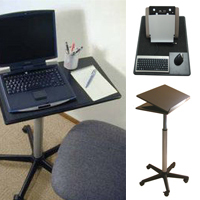 When placed on this tray, especially one installed on a keyboard arm with a similarly low profile mounting bracket, a keyboard and pointing device can be comfortably positioned at thigh level, and/or at a negative incline (tilted down) without restricting movement of the knees or thighs. 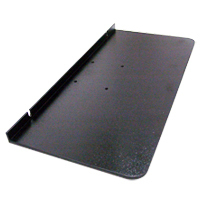 NOTE: This tray should be mounted on an Extended Track Ovation Low Profile Leverless Arm in order for it to completely retract under the desk when stored. If you have an arm already, compare this Hole Pattern to see if this tray can be fitted to your arm. Ideal for any application where the user sits, stands or moves about. Laptop area is covered with a heavy duty anti-slip foam surface. Comes with '5 star' caster base. Platform can be rotated for right or left hand writing surface use. Custom designed to provide a truly ergonomic laptop sit/stand solution, this new design is larger and built to accommodate a laptop in a laptop stand, a compact keyboard and mouse. The support column is now located to the rear of the surface (directly below the position of the laptop) to give freedom of movement to the legs - no more bumping of your knees.